The M28 is a concept Norton that brings the old British marque right into the 21st century. Industrial design student Arron Rogers created the updated Norton in his final year of Vehicle Design study at Coventry University. With an underseat fuel tank, a frame rail where the gas tank normally resides, girder front suspension, and a Virtual Pivot Point rear suspensin inspired by downhill mountain bike technology, the M28 is advanced, to say the least. Rogers went for light weight and race capability with this design, and used exposed structural components in place of bodywork. 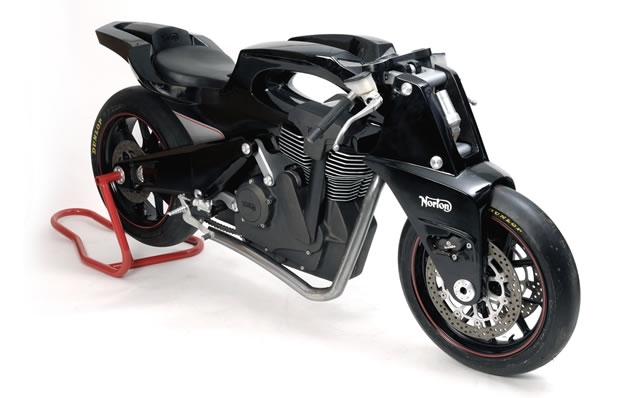 The bike uses a 500 cc Norton engine, which is also employed as a structural element within the carbon fibre chassis. He figures the 500 cc air-cooled Norton single would make 70 hp at 8,000 rpm on bio-ethanol, and with an all-up weight of 110 kg for the bike, power-to-weight would be respectable, to say the least. There are two forms of the bike: a race model (shown) and a roadster. Of course, there are no real forms of the bike, as it’s only a school project. Rogers spent four months interning at the Ducati Design Centre in Italy last summer and is now looking for work as a motorcycle designer.